Born in Douglas, Isle of Man, England, the son of James and Florence (Lord) Onley. His father was an English actor. Toni attended St. Mary's primary school and Ingleby Secondary School, Isle of Man, then studied under a local landscape water colourist John Nicholson and at the Douglas School of Fine Arts (1942-46). He came to Canada in 1948 and settled for a time at Brantford, Ontario. He took further study at the Doon School of Fine Art in 1951 under Carl Schaefer. 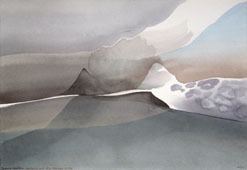 In his early work Onley was influenced by British painters John Cotman and Peter DeWint and did traditional landscapes. He married Brantford art critic and amateur painter Mary Burrows in 1950 and they had two daughters Jennifer (b.1951) and Lynn (b.1954). He worked at a variety of jobs in order to support his family. Exhibiting in the Western Ontario Annual show of artists under 27 he won an award in 1955. He exhibited as well with the Royal Canadian Academy, The Canadian Society of Painters in Water Colours and his work attracted the attention of art critics. Following the death of his wife Mary, Onley moved with his children to Penticton, B.C., where his parents had retired. There he conducted classes for children Saturday mornings and taught adults nights at Penticton High School. He worked as a surveyor, draftsman, commercial artist and continued with his own painting when time permitted. In 1957 he won a scholarship offered by the Institute Allende, San Miguel de Allende, Mexico, where he took his two daughters. During this period he studied mural painting and fresco and vinylite mediums and was very much influenced by his American (Yugoslavian born) teacher, James Pinto whose abstract impressionistic paintings set Onley on a new direction of non-objective work. He stayed in Mexico three years but returned to Canada to hold exhibitions at the Coste House (Calgary, 1958), Vancouver Art Gallery (1958), New Design Gallery, Van. (1959). By then he was experimenting with collage paintings usually of irregularly shaped pieces of painted paper or canvas pasted to a backing or canvas. Three of his collages were reproduced in Abraham Rogatnick's article on him for Canadian Art (Mar./Apr. 1962). In his collage work he did a Polar series numbered from one to beyond forty. These works on large canvases in cool colours of blue, black, grey, green, etc., drew favourable comments from critics and his Polar #1 won the $2,000 Royal Canadian Academy Zacks Award given to an artist at the society's annual exhibition. With this award Onley studied in London, England, while the award-winning painting was presented to the Tate Gallery having been selected by Sir John Rothenstein (Director of the Tate) as the painting he would like to have for his gallery from the 1963 RCA showing. During this period he studied etching and began to produce work in this medium as an extension of his painting. He had married Gloria Knight in 1961 and in 1967 their son James Anthony was born. In 1961 he completed a 300 sq. ft. mural for the Queen Elizabeth Playhouse in Vancouver and was also one of seven artists chosen to represent Canada at the Paris Biennial. In the years that followed he returned to objective basic shapes from nature giving full play to design with delicate colouring. Although a prolific artist he has been a careful craftsman whether working with paintings large or small, or with serigraphs, etchings and drawings. His silkscreen prints and drawings have received high praise and his paintings, articulate, simple, and subtle in colouring have been discussed by most of the leading critics and historians of the day. Flying has been a hobby which has enabled him to travel to various centres to conduct classes and a variety of other activities. Many of his pencil sketches have been done from the air. Marguerite Pinney made this note of them: "Lovingly executed, these pencil drawings are sketched while piloting his plane over the coast, mountains and valleys of B.C. Sure and delicate, they are a delightful and vital addition to a comprehensive and articulate exhibition." Joan Lowndes also described his drawings as, "…fantastic little pencil drawings, eight inches by six, that are the jewels of the show. They are so even in quality they might be compared to beautifully matched pearls. Onley presents nature in an undisturbed prepollution era, heavy with the stillness of primeval times. The lonely rocks send their reflections into the lake." Van. Art Gal., B.C. ; Univ. B.C. (Brock Hall Coll. ); Art Gal. Greater Vict. ; Simon Fraser Univ., Burnaby, B.C. ; Winnipeg Art Gal., Man. ; Lond. Pub. Lib. & Art Museum, Ont. ; Willistead Gal., Windsor, Ont. ; York Univ., Tor. ; Art Gal. Of Ont., Tor. ; Agnes Etherington Art Centre, Queen's Univ., Kingst., Ont. ; NGC, Ott. ; Musée d'Art Contemp., Mtl. ; Sir Geo. Williams Univ., Mtl. ; Mtl. Museum of Fine Arts, P.Q. ; C.I.L., Mtl. ; Confederation Centre, Charlottetown, P.E.I. ; Memorial Univ., St. John's Nfld. ; Seattle Museum of Fine Arts, Wash.; the Library of Congress, Washington, D.C.; Museum of Modern Art, NYC; Tate Gal. Lond., Eng. ; the Victoria and Albert Museum, London, England; And the private collections of Mr. & Mrs. Sam Zacks (Tor. ); Mr. & Mrs. Percy Waxer (Tor. ); Dr. Theodore Heinrich (Tor. ); Joseph Hirshhorn (NYC); John David Eaton (Tor. ); Paul Arthur (Tor. ); J.G. McConnell (Mtl.) and many others. Member: A.R.C.A. (1964); B.C. Soc. Of Artists; C.S.P.W.C. ; C.G.P. Toni was made an Officer of the Order of Canada, 1999. Scholarship, Instituto Allende 1957; Canada Council Grant 1961,1963; Jessie Dow Award at Montreal Spring Show, 1960; one of seven artists to show at the Paris Biennial, 1961; Spring Purchase Award (MMFA), 1962; Canadian Biennials exhibitor 1959, 1961, 1963, 1965, 1968; Sam & Ayola Zacks Award, RCA Annual, 1963; Canada Coucil Senior Fellowship, 1964.